What has been your biggest challenge since ordination? There are two challenges. The pastoral region itself is a challenge because it’s made up of three distinctly different parishes. It’s a wide diversity of people—you go into a different church every Sunday, and you get something a little different. But I like that. I try to be myself, no matter where I am. Back at Catholic Theological Union, we talked a lot about going into different cultures—referring to geography. But in a certain sense, in this assignment, there are three different cultures that you work with on a day-to-day basis. You respect the culture when you walk into anywhere you go. It’s a continuation of the education process. A second challenge for me is voice projection. I’m working with acoustics in the three churches, making sure to project my voice so that I’m heard. That’s going to be a lifelong challenge because I’m a quiet person. When I do speak out, I want to make sure I’m heard. I like interacting with people. 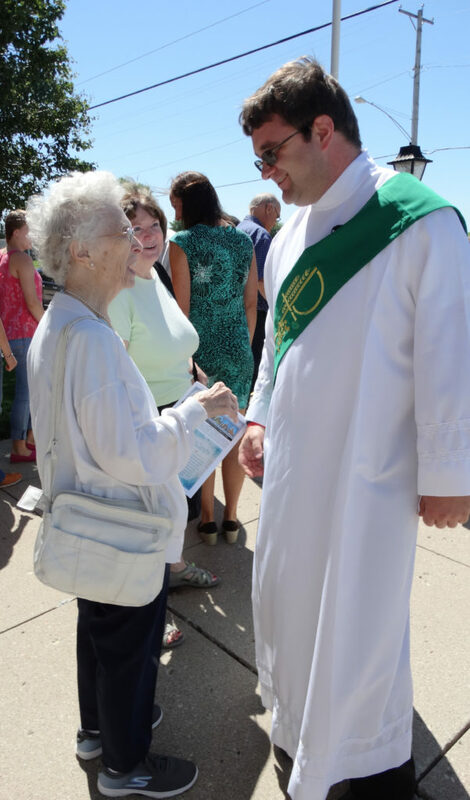 I like talking with people after Mass. Particularly on Sunday when a community gathers, that’s when the visiting happens. The difficulty for me is those times when I have to rush to the next Mass. But the gift is the lay people in the parishes who have everything set up and ready to go for Mass. All I have to do when I arrive is put my notes out for preaching. Lay people understand that you don’t have much time, and they do their part to make sure things happen. One of the biggest surprises is having the title of deacon in front of my name. It’s an adjustment. It took two or three months to get used to it. With Br. Matt Schaefer, C.PP.S., also at Emmanuel, I’ve been called brother, father, deacon—a mix of titles. As long as they don’t call me anything mean, I don’t care! Tell us about a favorite day, event or moment. My favorite day of the week is Thursday, when I’m teaching and visiting the school. Thursday is co-op day at Emmanuel (when home-school families come together for a day of classes and activities). It’s a highlight to my week. I try to make sure I walk through the school to see the kids and their families. I’ve been helping on Thursdays at Emmanuel with the Blue Knights. You might call it a Catholic version of the Boy Scouts. We teach one virtue each session and then work on a craft project that, because they’re boys, is usually a weapon of some sort. We’ve made shields, swords and arrows; one week we made helmets out of empty milk jugs and foil. The craft ties in with the virtue we’re trying to teach. We also play games. It’s fun but it’s a challenge, working with kids who are in grades one through four. It’s outside my comfort zone. It helps that there’s a high school student there to help me. And researching the crafts on YouTube helps. There are a lot of facets to this ministry. I’ve been doing a lot of baptism preparation classes. You try to find material to use, find something that’s worthwhile. All the classes have been one-on-one so far because that’s how the families have come in. I like that; it’s more personal. The first baptism where I presided, I was a nervous wreck. I hope they didn’t notice. Then as you go from church to church, you have to learn how to work with the space. Every place does it a little differently. Fr. 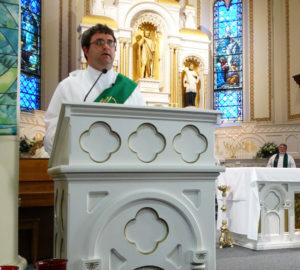 Angelo (Anthony, C.PP.S., the pastor) said, “I don’t have any time, but Deacon Matt can do it for you.” And so we did. That was the paschal mystery—they’d just lost a family member but were planning a baptism. On Friday we did the funeral for the patriarch of the family, and on Saturday we baptized a little one. That was pretty neat. At least 20 or 30 people from the family were there for the baptism. They were mourning and celebrating at the same time. 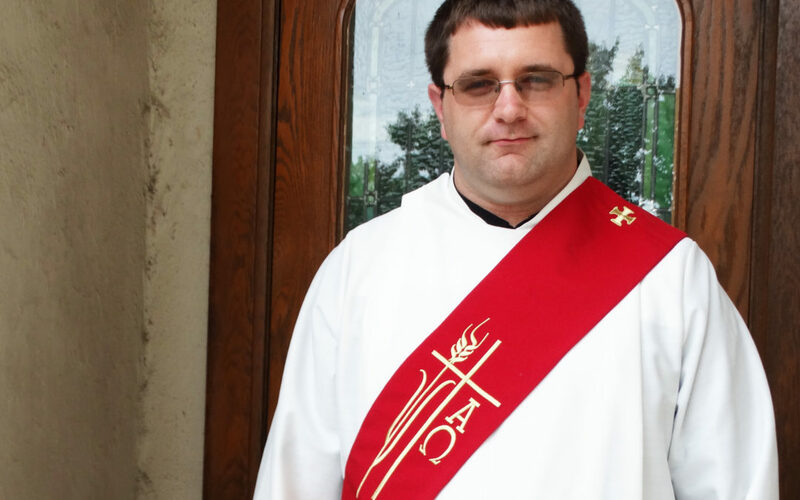 How has ordination changed you? It probably has not changed me as a person, but it’s changed my job, what I do. I do committals and baptisms, I preach, I sit in on parish council meetings, and do everything else that goes along with ordination. Have I changed as a person? I don’t think so, not dramatically. It feels good to be doing ministry after all those years of school. It’s 10 times better. You can only sit in a classroom for so long. I needed that change of scenery. It’s great to be out working with people versus reading textbooks. A textbook doesn’t say anything about people, only in theory. It doesn’t tell you how people really operate.